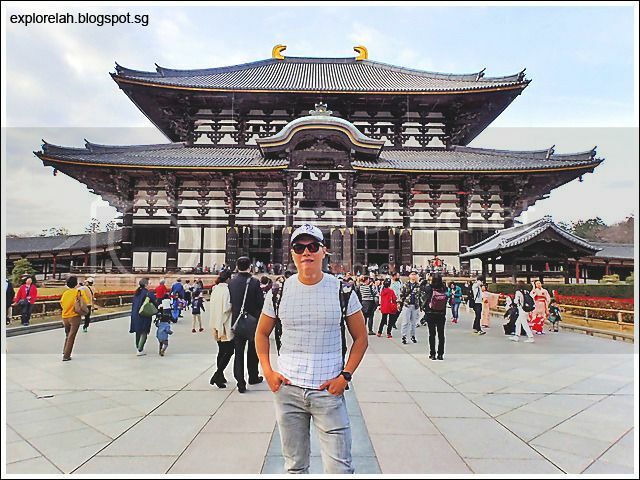 Ranked amongst one of Japan's most important historical landmarks and a major Buddhist temple in the country, Todaiji (東大寺 Great Eastern Temple) is an attraction that matches the nation's religious devotion in scale and presence. We almost skipped a pop over to this crowning jewel of Nara because we underestimated the time we would spend with Nara Park's deer and at Kasuga Taisha Shrine, the famous Shinto shrine of lanterns. But thankfully, we made it and were glad we didn't let a non-visit become that thing we regret not doing during a trip. 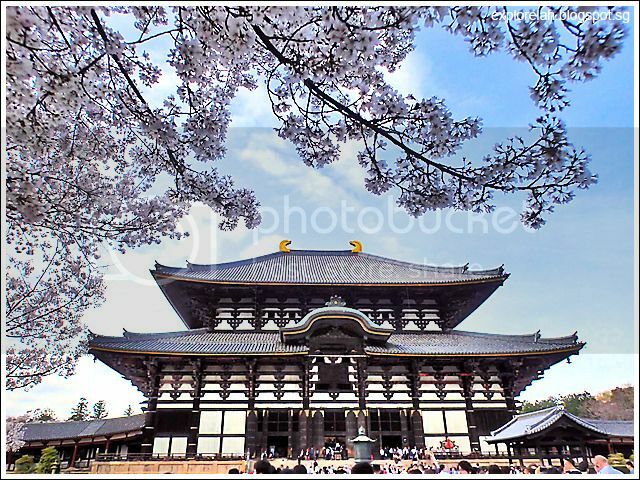 Todaiji's Big Buddha Hall (daibutsuden) is the largest wooden building in the world. The temple has an understated magnificence that is both commanding yet humble at the same time. It is grand beyond any doubt. But it is also inviting, unassuming, and rather serene despite the throngs of people visiting the sacred site. We came to Todaiji after visiting Kasuga Taisha Shrine by following signposts that pointed the way. The two religious attractions are not too far apart and took us only about 15 minutes to walk between them. 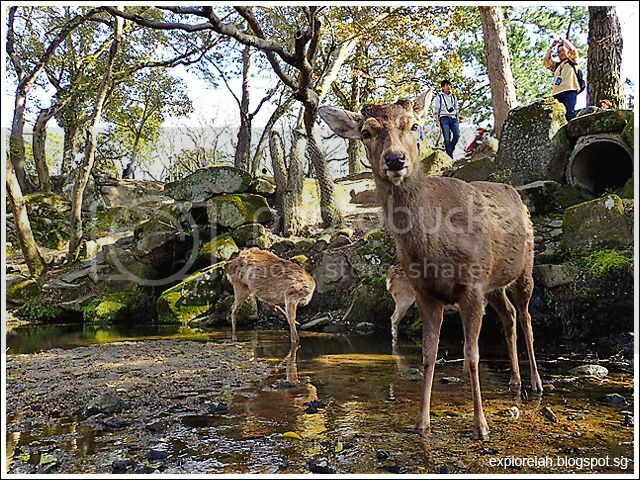 On the path leading to Todaiji's Great South Gate (Nandai-mon), we crossed a bridge over what looked like a dried up pond and in it were... deer! 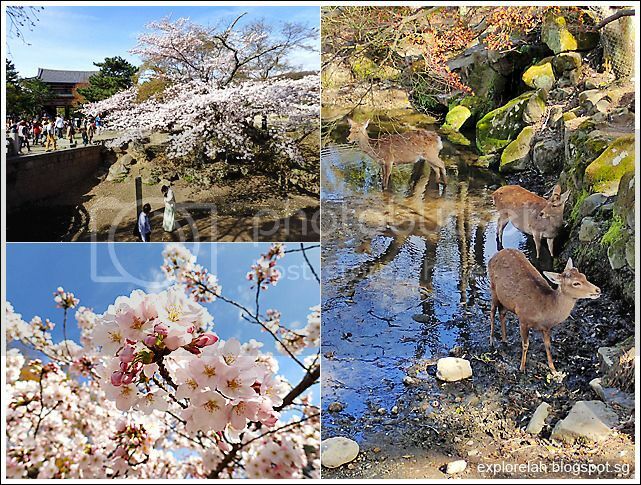 We've already taken many, many deer photos since we set foot in Nara but we just cannot tahan not photographing them at every change of scene we see them in. Synchronised head turning. 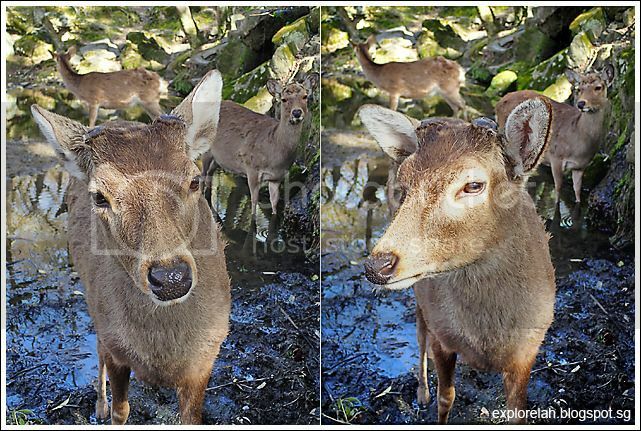 As I was shooting the deer in front, I realised that the deer behind synchronises its gaze with the front one. When the front one looks at me, the back one looks too and when the front looks to one side, so does the back deer. Is this adorable or creepy? LOL. We fell into the "deer trap" again and spent quite some time here photographing them although Todaiji was nearing its closing time. Fortunately, we managed to stop the deer from hijacking our cameras anymore and managed to explore Todaiji. Completed in 1203, the Nandai-mon or Great South Gate has architectural influences from China's Sung Dynasty and is the largest temple gate entrance in Japan. This is the Godzilla of Japanese gates. 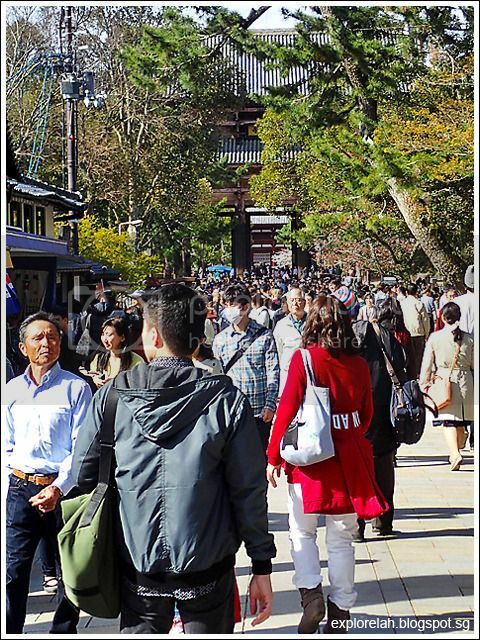 The amount of foot traffic to Todaiji was crazy during our visit which coincided with sakura season. 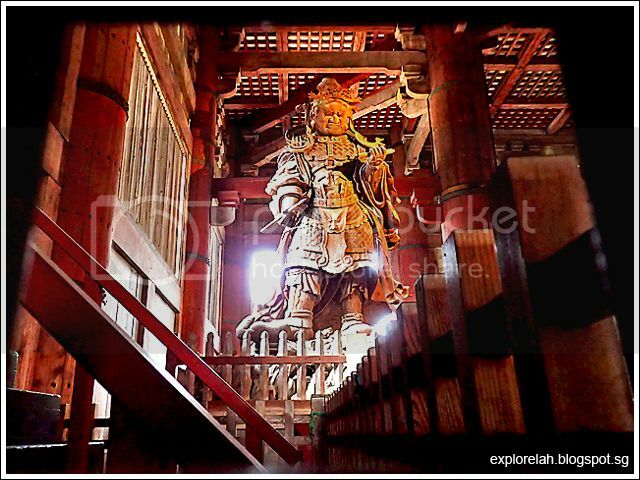 Made entirely out of wood, the original Nandai-mon was destroyed in a typhoon and the current day's structure is a rebuilt version dating back to the 12th century. 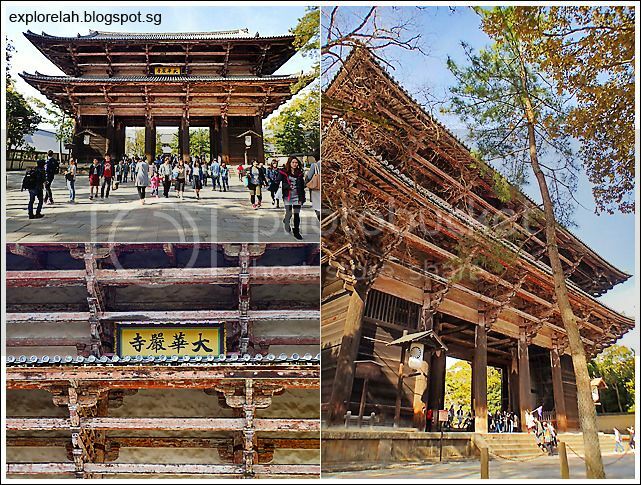 Over 25m tall, the south gate has 18 massive pillars that come from single trunks of trees. 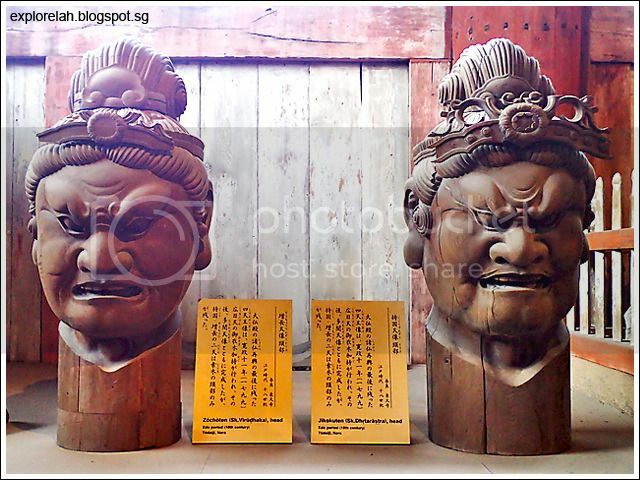 Two colossal guardian deities each standing at 8.4m height are found on each side. Known as the two kings of Todaiji, the duo is part of the Four Heavenly Kings (四大天王) who guard the four cardinal points. 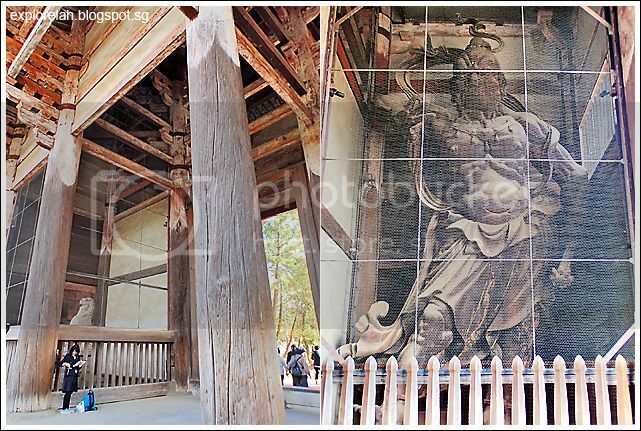 The other two are found inside Todaiji's Main Buddha Hall. I find it fascinating to see how Buddhism is translated into a plethora of architectural styles... from the colourful and ornate jian nian (cut-paste 剪粘) roofings characteristic of China's Chinese temples to the all-seeing eye hallmark of Tibetan temples to the flambouyant gold-gilded wats of Indochine (Thailand, Laos, Myanmar) surrounded by a proliferation of stupas (with the exception of Cambodia's favour for sandstone) to Japan's colour-subdued, minimalist zen approach to temple buildings. 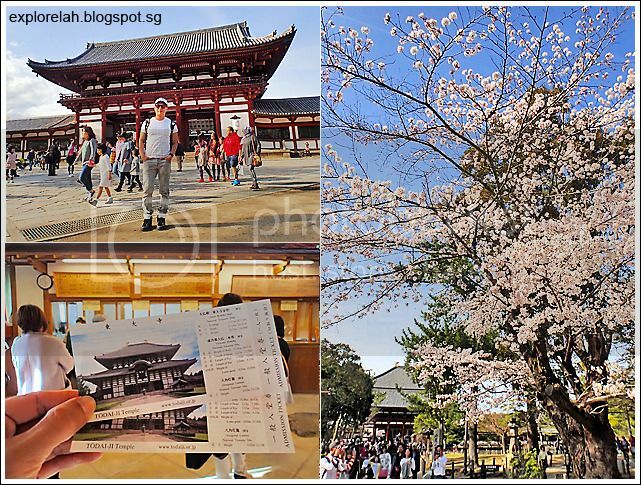 The compounds of Todaiji have a lot of space and an understated beauty that when paired with the season's flourishing sakura blooms, make for postcard-perfect photographs to relish a visit with. Passing through Nandai-mon, we came to yet another gate where entrance tickets to Todaiji are sold (￥500 per entry for adults). And finally we got to lay eyes on Todaiji with the sakuras in bloom! The temple compound is very neat and picturesque. 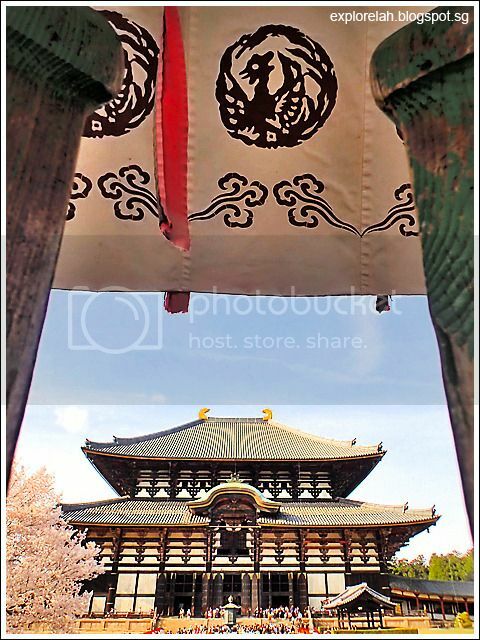 Framing Todaiji with the weeping fuchsia variety of sakura. That essential "I'm here" shot :o) The thing that's as big as the temple is my expanding waistline from all that feasting on Japanese donburis (rice bowl dishes) and ramens (noodles). A intricately carved octagonal bronze lantern greeted us as we got nearer to the temple and I got a closer look at the motifs that adorn the prayer hall's entrance doors. 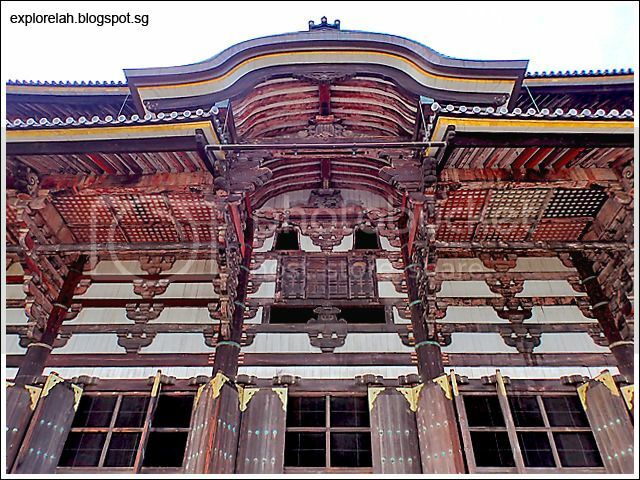 Upper facade of Todaiji Temple. 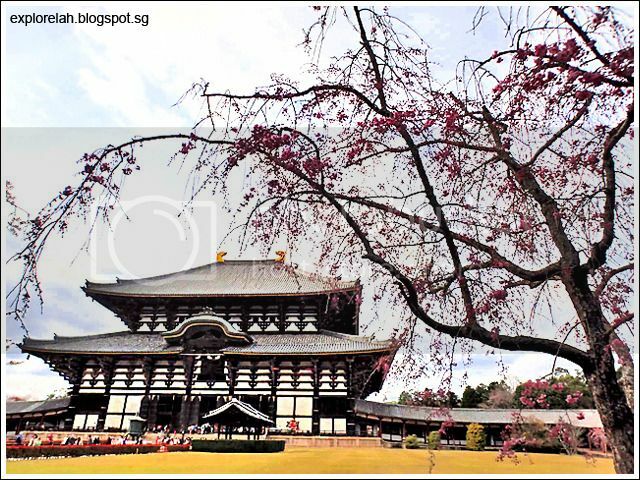 Small is not in the vocabulary of Todaiji as everything about it is larger-than-life. Huge gates, big entrances, towering pillars, and gigantic statues... instead of making me feel small, it's as if the temple made me a bigger person just from trying to contain the sight of its sheer size. To the right of the temple is an 18th century wooden statue of Binzuru (Pindola Bharadvaja), one of the 4 arhats (enlightened disciples, much like the saints of Christianity) that Buddha requested to stay on earth to spread Buddhism. 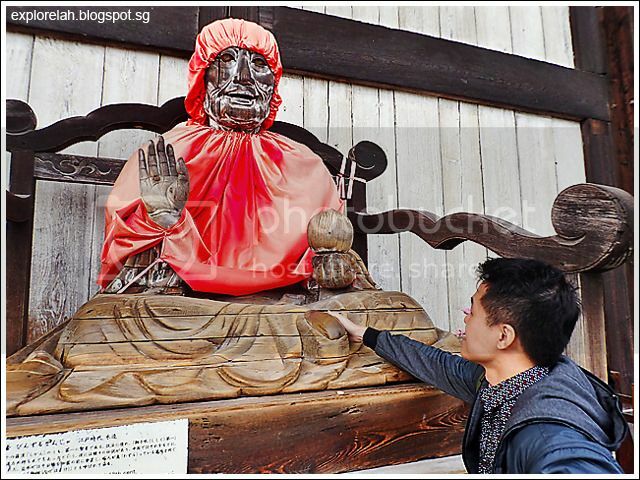 Binzuru is a master of mystical powers and the Japanese believes that if you touch a part of Binzuru and subsequently rub your hands on a corresponding part of your body, you will receive healing of ailments affecting that body part. 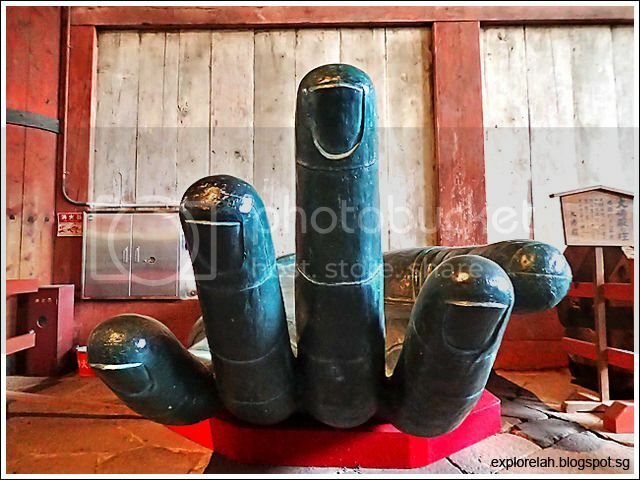 As the statue is elevated, the only parts that can be touched are the lower limbs region. Too bad if you're suffering from asthma or headaches. 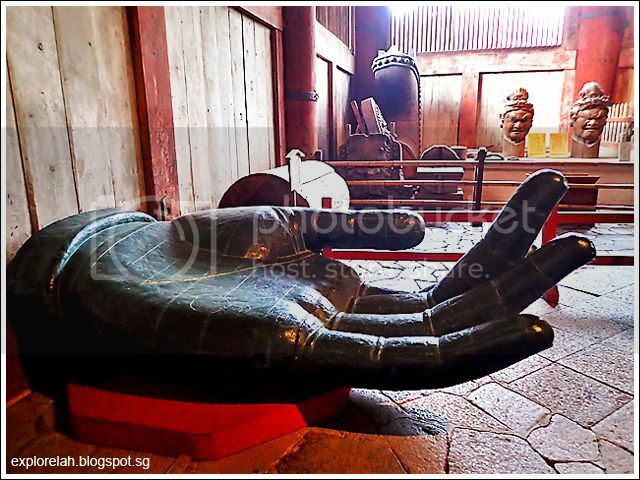 Just for fun, I touched the foot of Binzuru like the guy in the photo and touched both my feet as I've been suffering from plantar fasciitis, which is the pain that stretches the length of the sole for many months, and guess what? My condition improved tremendously after I returned from the trip! I'm a skeptic when it comes to such religious healing stuff and I've clean forgotten about this touching ritual I performed until I write this blog post and remembered what I've done and made that connection about the improvement in my condition. Then again, it could be that my condition was already on its way of getting better and it was just a coincidence that I followed the ritual (for the fun of assimilating myself as a local) even though I didn't believe in it. Sharing this anecdote, I'm not advocating that the ritual works, but just musing about the forgotten correlation. If there is even one at all. Om... 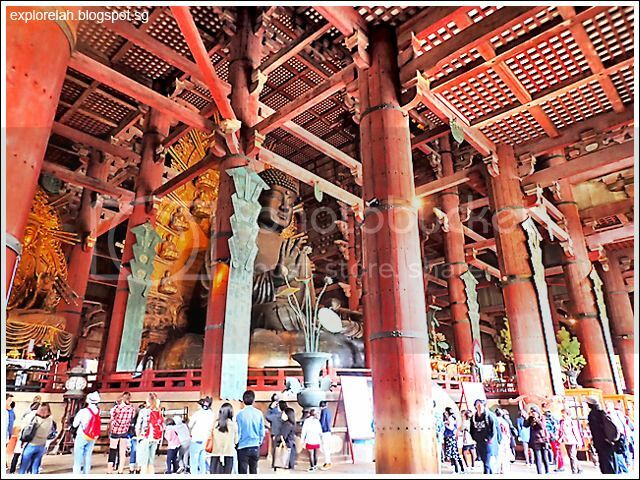 This Main altar of Todaiji with a 15m tall giant Buddha (Daibutsu) that is one of the biggest in Japan. 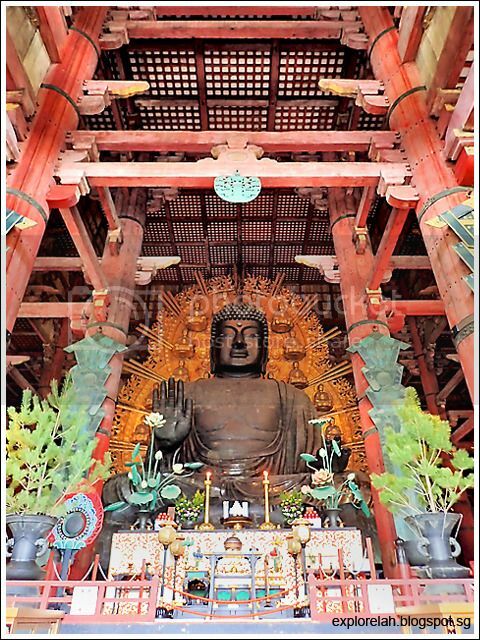 Every time I visit a Buddhist temple in a different Asian region or country, a distinct style of architecture and decoration is apparent although some elements such as the lotus motif is common. Even though we believe in different gods / prophets, the message of love, compassion, tolerance and peaceful coexistence is common. The giant Buddha was completed in 752 and went through several rounds of restoration, once when its head fell off during a major earthquake in 855. The last restoration works were done in 1185 (body) and 1692 (head). 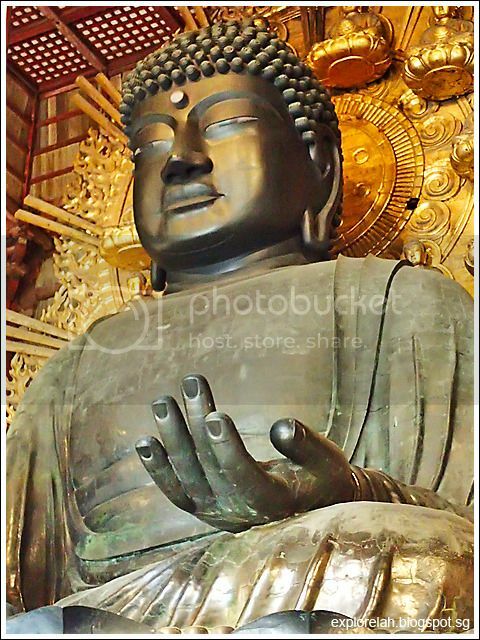 The statue is designated a UNESCO World Heritage Site Historic Monuments of Ancient Nara and a National Treasure. 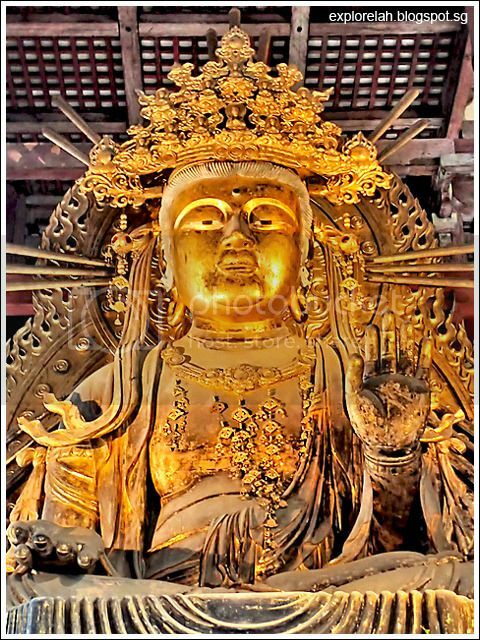 To one side of the giant Buddha is a gilded statue of Kokūzō Bosatsu, the Bodhisattva of wisdom and memory... I sure need lots of these two qualities! In the temple are the remaining two of the Four Heavenly Kings who guard the four cardinal points. This one is Komoku-ten, king of the west and lord of limitless vision who can see through evil. 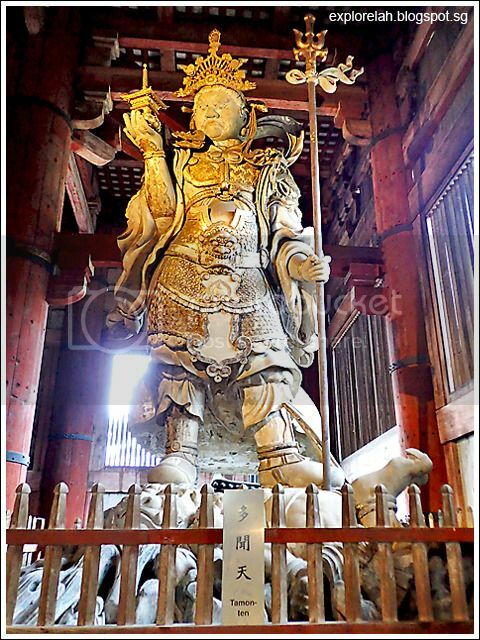 The other Heavenly King in Todaiji is Tamon-ten, king of the north and the lord who hears all. Do you need a helping hand with life's problems? Or give those problems the middle finger and carry on! Bas-relief of Zocho-ten (king of the south, lord of spiritual growth) on the left and right is that of Jikoku-ten (king of the east, guardian of the nation). Do You Want to Attain Enlightenment? 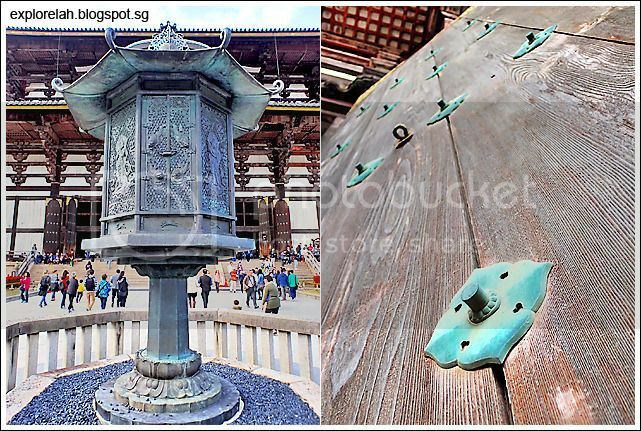 From the towering proportions of Todaiji's religious statues, we now shrink our attention to a hole at the base of one of the pillars in front of the Tamon-ten image. 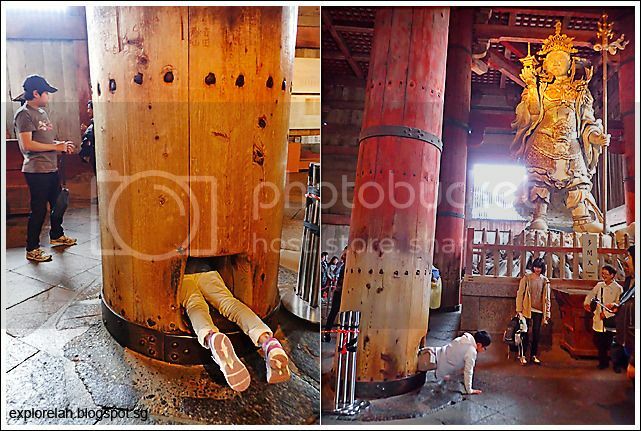 The hole is the size of Daibutsu's nostril and it is said that if you can squeeze yourself through one side and come out the other side, you will be able to attain enlightenment in your next life. So if you want to attain enlightenment, pretend you're a thread trying to pass through the eye of a needle! 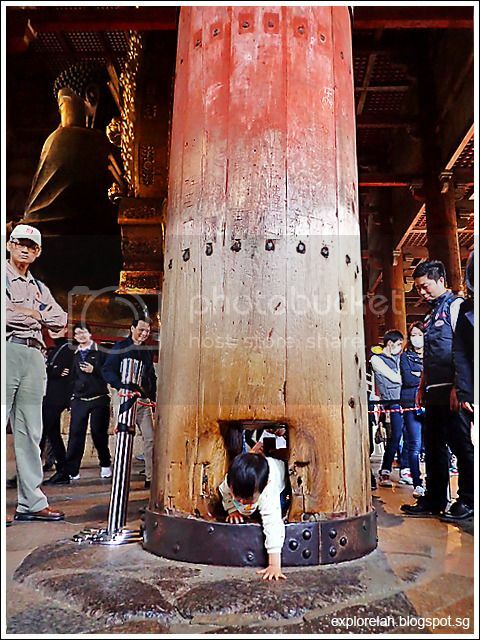 Squeezing through the hole is a very popular activity in Todaiji and there's a long queue to try being Buddha's booger. I didn't put myself through it because the hole can obviously fit only small children and very, very petite adults. Or it can act as a measuring device to determine if it's time to lose weight. If you can pass through, you are fine, but if you stuck, it's a heavenly sign to give up char kway teow! But I think the hole is a measure for innocence and purity, for only the pure of heart can attain enlightenment. So my interpretation of this activity is that... in order to be "enlightened", we must first cultivate our hearts and thoughts so that they are innocent and pure like that of a child. ... "Therefore, whoever humbles himself like this little child is the greatest in the kingdom of heaven." Gospel of Matthew [18:4]. I see a similarity across religions despite the differences in the definitions of who/what is god. It is not easy to get into heaven or achieve enlightenment. It takes humility, not hostility. It requires compassion for fellow humankind, not destruction of innocent lives. Whoops... there I go again rambling about the interpretations of things I saw instead of providing more useful visitation information about Todaiji. Please pardon me. This Japan trip had been very special for me and I wanted to recount and reminisce every bit of it as a way of reliving, and then recovering from, the depth of my love and filing it as a beautiful memory. If only there's a god to pray the heartbreak away.